Call the beautiful desert of Tucson, AZ your home. Immaculate landscaping surrounds our secluded community located minutes from Steele Elementary, Gridley, and Sahuaro schools. We have a wide variety of floor plans to choose from with open interiors you'll appreciate. You can entertain guests by the pool or in our beautiful clubhouse. All residents also have access to our brand new fitness center. 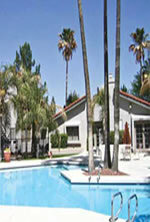 Arcadia Gardens is everything you would expect in a quality apartment community and more! Go east on Broadway, past Kolb to Pantano. Go south on Pantano two blocks to Uhl. We're on the west side of Pantano.